Ha-Shilth-Sa is Canada’s oldest First Nations newspaper and is the newspaper of record of the Nuu-chah-nulth people. It has been published by the Nuu-chah-nulth Tribal Council since 1974. Ha-Shilth-Sa means “interesting news” in the Nuu-chah-nulth language. Ha-Shilth-Sa reports on the activities and initiatives of the Nuu-chah-nulth peoples of the West Coast of Vancouver Island, and provides a First Nations’ perspective on news from Vancouver Island, around the province and across Canada. Ha-Shilth-Sa is published in print each month and delivered by mail to the homes of subscribers and to First Nations in British Columbia, as well as other individuals, businesses, institutions, organizations, governments and agencies in Canada and the United States interested in First Nations issues, concerns and culture. 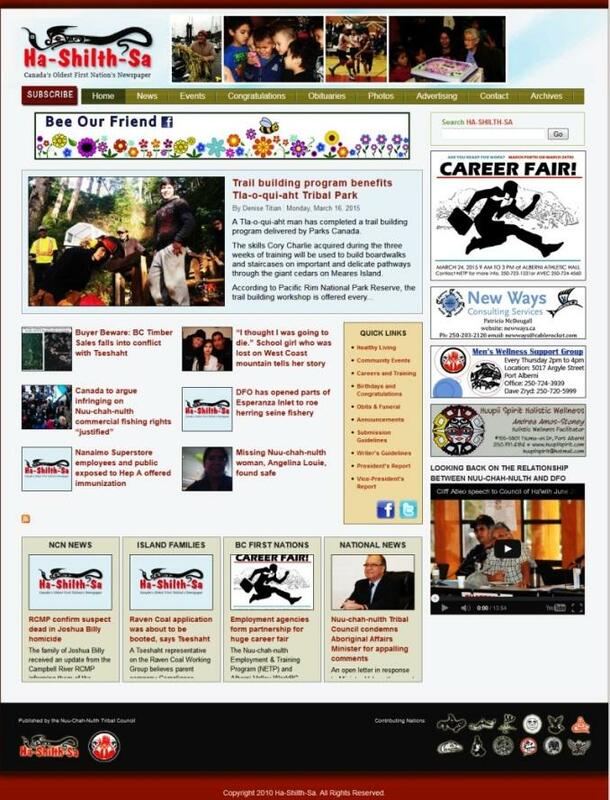 Ha-Shilth-Sa is now online at www.hashilthsa.com featuring breaking news from Nuu-chah-nulth communities, careers and training opportunities, event news, photo galleries, videos, and announcements. We also stream special events live on the site. Join us on Facebook at facebook.com/hashilthsa.ntc or follow us on Twitter @HaShilthSa and be among the first to get our interesting news. We’re on YouTube too at Channel Hashilthsa1.